Intellipharm has provided analytics and data services to retail pharmacies and manufacturers for over a decade. Gathering, understanding, and applying insights from sales data is as paramount to the success of pharmaceutical retailers as it is to any other retail sector. 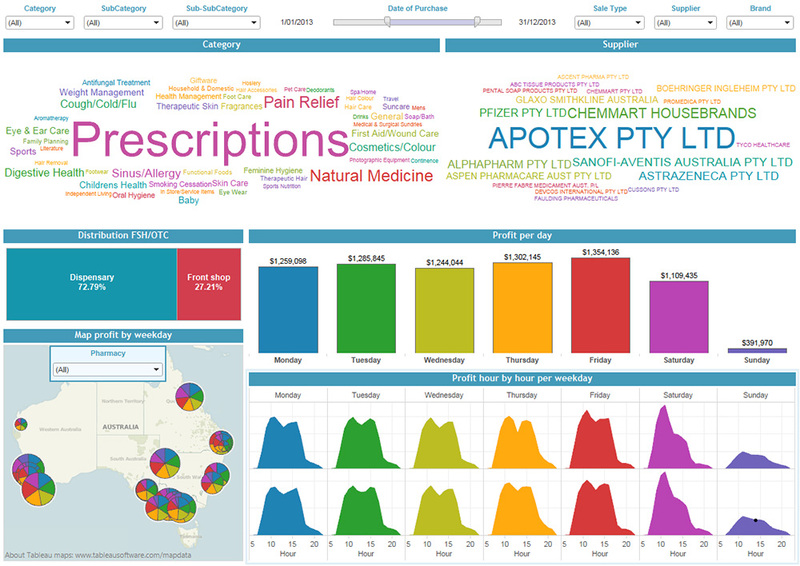 Using Tableau Server, Intellipharm embeds dashboards into their suite of web-based business intelligence products. After adopting Tableau, Intellipharm’s software had fully functional dashboards within two weeks. Intellipharm employees also use Tableau Desktop and Server to build and share visualiations. Intellipharm’s pharmacy customers capture large amounts of data, on everything from minute operative details to product sales, revenue, stock levels, periodic updates on turnover and more. This information comes flooding into Intellipharm’s database on a daily basis. Needless to say, packaging it up in a user friendly format was a real challenge. The company was using web technologies to interact with the huge quantity of data, which proved incredibly time consuming. As Intellipharm continued to grow, it was simply not feasible for the business and its customers, who rely on the business intelligence provider for real-time information, to continue with the web technologies. “In pharmaceuticals, a hay fever medicine becomes obsolete when the pollen settles. Seasons and trends can change in a matter of days. The last thing we wanted to do was present stale information to our customers,” Leny said. Web technologies like PHP were also difficult to drill down. In fact, Leny was the only team member able to interact with Intellipharm’s data using the unfriendly web technology system. Data reaches Intellipharm’s database from thousands of sources in various formats. From there, the web technology system was slow in converting the data into one efficient flow of information, delaying the speed to action for customers. “We were meeting barriers throughout the process which meant our customers had to wait longer for insights. We recognised this delay and even created a new business unit to speed up our response time,” Leny said. Despite this change, Leny was still pressed for time, sieving though two billion rows of information to present blended data insights. “We could typically present a report to our customers on one data set – their revenue or stock for example – but not how each set affected the others,” said Leny. Intellipharm needed a system that allowed its team to pull a customised report encompassing multiple data sets so customers could view the entirety of their data. Web technologies simply weren’t allowing data sets to speak to one another. “We were sure there was a goldmine hidden within the static database system just waiting to be analysed,” said Leny. We were looking to create reports that showed customers how every facet of their data could reveal an entire business story. We wanted to give them that ‘ah-ha!’ moment when they realise the cause and effect of business operations. Having partnered with Tableau in a prior role in France, Leny knew where to turn for a trusted business intelligence solution. “Fairly quickly we made the decision to employ Tableau Desktop and Tableau Server to embed different dashboards into a web-based solution,” he said. In two weeks the software was fully implemented and functional, with Intellipharm customers consuming their own data through Tableau-powered dashboards. Thanks to Leny’s past experience the team required minimal training and quickly integrated Tableau into Intellipharm’s client-facing operations. “They may not fully realise it, but our customers are truly reaping the benefits. Tableau actually comprises the backbone of the detailed and visually appealing displays our customers rely on,” Leny said. Thanks to Tableau’s user-friendly interface, Leny is no longer the only team member gathering and visualising data. “I was the only person using Tableau at Intellipharm originally but my colleagues’ soon developed an interest in it. Now a third of the staff are able to benefit from using the software,” he said. The journey continued as Intellipharm moved to Tableau Server. Within 12 short months, 10 of the 30 Intellipharm staff members were able to leverage the data on the Tableau Server. They were able to build their own visualisations and ask their own questions of the data, rather than looking to Leny for clarification. Using the copious amounts of data accessible to them, the team was able to create a central platform as well as a self-service program with multiple models. “Whether our customers want to analyse the marketing space or see their sales, we now have models to suit each individual need. We have between 30 and 40 models which allow our customers to analyse and understand their businesses,” said Leny. Customers have been surprised at the insights this new method of analysing data has yielded. Data sets can now speak with other sets to form new understandings, giving businesses a valued birds-eye view. “All our customers were amazed at the insights they could gather on their sales transactions, with the dashboard spanning information on date and time in relation to sales quantity or profit. Interestingly enough, we learnt there’s a peak in cosmetics sales on Friday afternoon!” laughed Leny. In the past we were spending up to three weeks creating one dashboard. We can now have that same dashboard created in two to three days and delivered in an easy-to-understand visualisation. 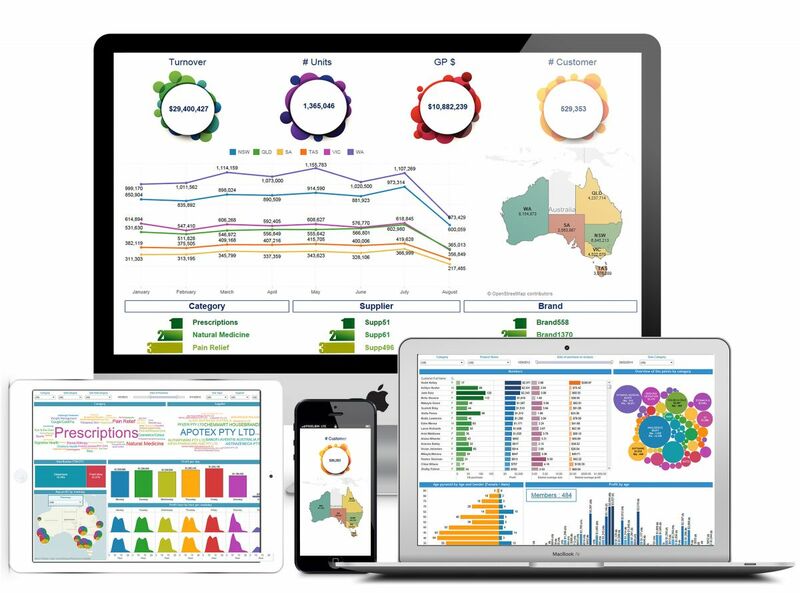 With Tableau underpinning insights, Intellipharm can analyse and present data while it is still relevant, enabling pharmacies to carry out timely actions to improve performance. For example, if an item is not selling well in a store it can be relocated or remarketed. 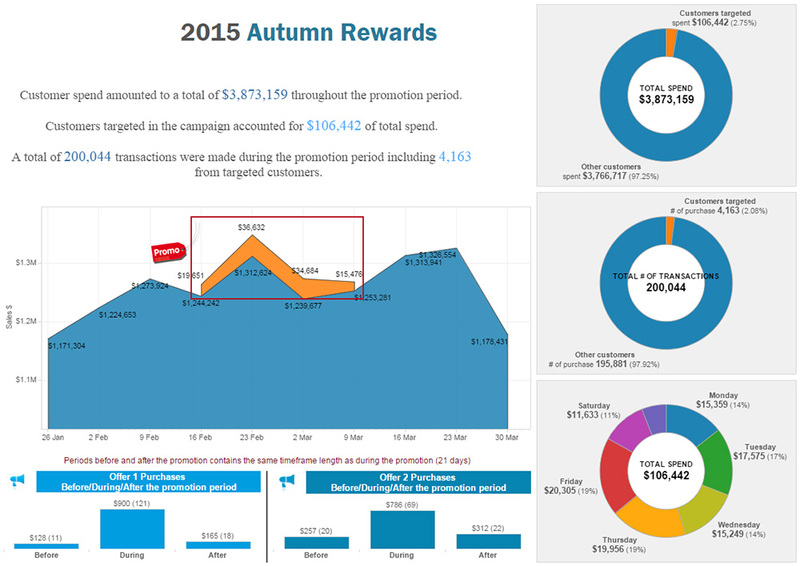 “In the past we were spending up to three weeks creating one dashboard. We can now have that same dashboard created in two to three days and delivered in an easy to understand visualisation,” said Leny. Efficiency is the first noticeable improvement – but it doesn’t stop there. Gaining more time since using Tableau, Leny now celebrates the hours he is able to commit to other areas. Intellipharm customers are also enjoying the improved efficiency, accessing data immediately to compete in a more agile way. “After just one day of training on how to get the most out of their dashboards, customers realise how easy they are to use and see their data in a new light,” said Leny. “We create the dashboards which drive our customers’ businesses forward. They consume the visualisations on the fly, on tablets and mobile devices. They know where to click and how to navigate the program and have been overwhelmed with the unexpected insights they’ve uncovered." Leny envisions an exciting partnership ahead. He hopes to expand the Tableau relationship to offer the interface at a store level, so each pharmacist can not only consume dashboards but also create them.